This is not how I expected my evening will turn out to be. 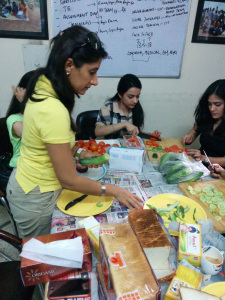 We were doing an event in our office called Seva Sandwich. There were volunteers who came with loaves of bread, butter, jam, tomatoes and cucumber. There were some 10 of us huddled together. We were peeling cucumbers, spreading butter and jam on bread slices and packing the finished product nicely in aluminium foils ready to be distributed to people on the streets and shelter homes in Delhi who sometimes find it difficult to manage one square meal. Next Post The Journey of Volunteering – as it began! great job guys. i have registered myself as a volunteer plz let me know if i can help in anyway.